Richie was first elected to office in June 2009, and he is married to Marie with whom he has three children. He is a former intercounty footballer with Louth and Drogheda United and also Drogheda Rugby Club. He captioned the Louth senior team for a number of years, and he also managed Newtownblues senior team to win the Louth Senior Championship in 2009-2010. He has a strong sense of civic duty and is a compassionate and caring elected member. He is member of the Action Against Addiction North East Group, and is involved with Drogheda’s homeless shelter. He has also fundraised for St. Ita’s Special Needs School and also Drogheda’s Women’s Refuge. An all rounder he is also involved with Newtown Blues GAA club and St. Colmcille’s Gaelic Football Club, as well as Drogheda Town Football Club and is a member of Layland-Bettystown Golf Club. He also has strong business acumen and is actively seeking foreign direct investment to Drogheda. 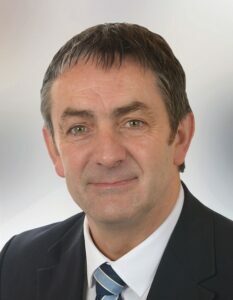 He wants to see improvements in sporting facilities available to local people and to improve tourist footfall within the town and also in the Boyne Valley region. Energetic, dynamic and proactive he recently went to San Francisco where he, along with the IDA, was instrumental in negotiating with Yapstone, which is involved with handling payment transfers on rental properties, to set up an office in Drogheda. A substantial amount of jobs will be created as a result of this new venture. He also was a key figure in collaborating with the Council to secure a Skate Park for Drogheda. Multi-skilled, he is very much looking forward to being a strong and defective voice to represent all the people within his local electoral area.